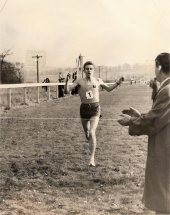 Mel winning in Harlow in 1967 in 2:18:25 – his first marathon. I first saw Mel in action when he won the Scottish Junior Men’s Cross Country Championship in 1964. This was probably the best cross country race that I ever saw with a really top class field of athletes who would go on to represent and win medals for Scotland and Britain in the not too distant future. Coming from the West of Scotland and being familiar with Lachie Stewart and Ian McCafferty among others, we were surprised to see this very good looking runner in a yellow vest (we didn’t even know who wore yellow vests!) won a hard, hard race dropping first Lachie and then at the very end moving away from Ian. My friend Cyril o’Boyle and I both reckoned that he was the best of a wonderful bunch of athletes. This was proved by some wonderful runs and top class times on the track and the road as well as over the country before, like many another very good runner, he succumbed to the charms and challenges of the hill and fell running scene and became one of the best ever at that. 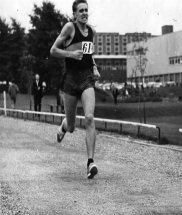 For instance , in 1963 after the victory described above and the subsequent selection to run for the Senior team at the international cross country championships, he appeared in the Scottish Ranking Lists for 1963 in the 880 yards – 1:56.5; Mile – 4:14.9; Two Miles – 9:14.7 and Three Miles – 14:40. By the victory in the marathon at Harlow in 1967 his appearances in the lists tended to get better the further he went – Mile 4:14.8; Two Miles – 8:56.2; Three Miles 13:51.6, Six Miles 28:27.0 and Marathon 2:18:25. He had many problems with illness and injury but none of them stopped him being one of the best ever. It was 40 years before I met him and during that period he had a rich life as an athlete – not many runners have been as adventurous as Mel has been and that is a rare quality in any man. His own story is at the link below to ‘The First 50 Years’: for an informative, educational and amusing read you must visit it. At the end of my first year in Aberdeen Grammar School in June 1961, I fought a slow but dogged way through the Heats and into the Final of the Junior 880 yards before finishing eighth (and dead last). From another planet was a tall, thin, dynamic 6th year boy who dominated the opposition to win the prestigious Senior One Mile title. That heroic figure was Mel Edwards who lived only a few hundred yards from my house. By the time, as Grammar Mile winner in my time, I started Aberdeen University, Mel had been and gone, leaving behind a a fine athletic reputation a track and cross country. Towards the end of my first year, in summer 1967, I remember thinking myself fit enough to join him for a late afternoon five mile training run from King’s College round the Links Golf Course. While I panted, speechless, and strained to keep up, Mel kept on talking, praising, encouraging – and this was my only session of the day while it was Mel’s fourth! It was his marathon racing period! We all knew he trained like a madman, running endless mileage including 60 x 220 Zatopek-style. An extremely fine racer but an Olympic champion trainer. We all believed that he ought to rest a bit more – (partly because of jealousy – there was no way we could contemplate dedicating ourselves to training as hard as he did) Eventually he got ‘injured’ and had to give up road running. So what did he do? Years and years of hill racing! No one understood how his legs could cope with bashing up mountains and zooming down them while he said he was unable to cope with flat tarmac! 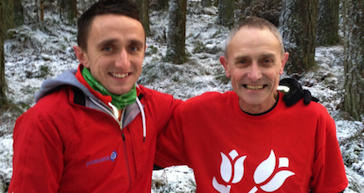 “When I turned 40, Mel was an important part of the Aberdeen AAC veteran cross country team. In February 1988 at Dalmuir, after winning the Scottish Veterans M40 title, I glanced back a few moments later to see Mel punching the air with delight as he crossed the line just ahead of Rod McFarquhar to win the M45 title. His first cross country one since his Junior title in 1964. Mind you, he had hardly been idle in the interim. That day Aberdeen AAC won the team title plus five individual medals. Rod’s shockingly bad taste joke was that the last team to do that much damage in Clydebank had been the Luftwaffe! Much later, in 2004, after we had both won age group medals in a particularly gruelling Scottish Vets Cross Country Championships over a horribly hilly course in Cupar, and we were slumped and totally knackered in the gym, we agreed that the ability to keep going when knackered was important! But Mel Edwards will be remembered by a vast number of people when other runners are long forgotten. His dedication has given so much to the sport – by organising races, coaching, dispensing training advice to joggers and fellow international athletes, inspiring youngsters and writing articles. Yet his personality has the lasting impact. Fitness, determination and a constantly positive attitude saw him overcome a serious illness. Hospital visitors left believing they must be ill because Mel certainly didn’t seem to be! All the time, Mel is incredibly enthusiastic, supportive and motivating. Even when I shaved a few seconds off his vets record for the Scolty Hill Race he was more congratulatory than miffed. Read below his own account of and amazing career. The man is an Aberdeen legend. Undoubtedly he should be Meldrum Barclay Edwards, MBE. The best exposition of Mel’s excellent career over the first 50 years of his involvement is contained in his own reflections of his career and they can be found from the link below. I have simply scanned it in exactly as Mel wrote it.